Going beyond simple waterproofing and cover, these extreme tents are made for the harshest conditions. Wind, rain, sleet and snow are no match for the tents on this list. Thermo-sealed seams and double mosquito net interior to help keep pesky critters out. High-grade ventilation and extremely wind and waterproof. We’re pretty sure this baby has been wind tunnel tested, and it’s no joke. Probably not the best for way up Everest, but for most domestic trips, it’s a solid choice. As well as being strong and sturdy, the Altus 41500DI036 Light Series Tent is lightweight and features double doors with mosquito netting, making it great for hot weather and forest camping. 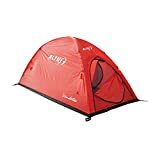 The tapered design makes is extremely sturdy in high winds, and the ventilation system helps to keep clear air circulating throughout the tent. Made from highly durable, waterproof and coated polyester. No chance of rain or snow getting inside this one. 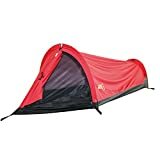 It’s not the cheapest, but the Altus 41500DI036 Light Series Tent is trustworthy, in our opinion, and those thermo-sealed seams are a great addition, especially in very wet conditions.